A 6-1, 175 center from Chelmsford, Mass., who scored 39-47-86 in 36 games with seven game-winners for the Junior Bruins Empire league entry, Eichel will join BU’s 2014 recruit Jonathan MacLeod on next season’s NTDP U17 team in Ann Arbor. In his first season with the Junior Bruins, he had a 15-21-36 line. Last summer, he was, according to USHR, the best player at the USA Hockey Select 15 tournment. “He’s a real special player with tons of talent. In the 10 or 12 years I’ve been coaching, I’m not sure there’s a player I’ve coached that’s as talented as he is. If he’s not the most talented, he’s certainly in that discussion. “There’s a reason why he’s as good as he is and a big part of that is the time and effort he puts into it. He’s always been one of the best ’96s, but over the last several years he has continually distanced himself from his age group. The three Terrier recruits who returned from the Czech Republic with gold medals in the 2012 World U18 Championships all played key roles in Team USA’s fourth consecutive tournament title. Forwards Matthew Lane and Danny O’Regan and defenseman Matt Grzelcyk-- all members of BU's soon-to-be-finalized 2012 recruit class-- earned kudos in post-tournament player reviews from United States of Hockey’s Chris Peters, who did play-by-play for the fastHockey Webcasts of U.S. games. Matthew Lane — If you didn’t know much about Lane before, you better start learning. He was named one of Team USA’s best three players at the tournament and was more than deserving of that honor. Lane posted seven points (3g-4a), but was so much more than that. With his strong forechecking and ability to win just about every puck battle he was in shows that he can be a force. Lane’s speed is his standout tool. He might be Team USA’s fastest forward. He’s not just fast though, as he knows how to use his speed to generate offense. Lane’s line with J.T. Compher and Frankie Vatrano had a lot to do with Team USA’s success at the tournament. 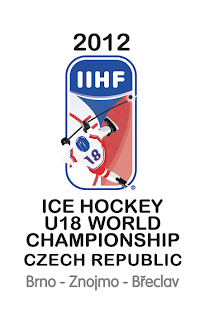 It is likely that Lane jumped up a round or two with his play at the U18 Worlds. Committed to Boston University. Daniel O’Regan — The lone non-NTDP player on the roster may have been the biggest surprise of the tournament. O’Regan has some incredible puck skills and creativity and may have been Team USA’s best center at the tournament. O’Regan had four points including a dazzling goal against Sweden’s Oscar Dansk in which the American forward put his skills on display. After picking up a loose puck, O’Regan skated in and deked Dansk out of his jock before stuffing it five-hole. O’Regan has a high upside because of his puck skills and good hockey sense. As he builds strength, he could become an offensive force. Committed to Boston University. ►Defenseman Ryan Ruikka, who will graduate next with two bachelor's degrees in economics and math along with a master's degree in economics, has elected to return for his final season of eligibility while pursuing a master’s degree in finance. At this point, BU expects to have six returning defenseman on its 2012-13 roster. ►Beginning next season, Agganis Arena will have high definition video replay capabilities, enabling faster and more accurate reviews by officials, according to a news release from XOS Digital. ►Elliott Dribben, the #1 fan of BU athletics having attended more than 5,000 events since 1955, will be honored on May 6 when the entrance to the Case Center—home of the Walter Brown Arena—will become the "Elliot Driben Lobby." Known as The Mayor of Terrier Nation , Dribben became involved with Terrier Hockey through Tim Regan, Hall of Fame goaltender for the Terriers' back-to-back NCAA championship teams in 1971 and 1972, who took a speech class with Dribben and welcomed him into the BU hockey family in the fall of 1968. 2013 recruit Robbie Baillargeon scored his third goal in three playoff games as Indiana defeated Dubuque, 3-1, to sweep its Eastern Conference semifinal series in the USHL playoffs. The 6-0 forward from Brewster, Mass., who will attend the NHL draft combine in Toronto next month, had scored 14 goals in 54 regular season games in his first USHL campaign. Indiana next faces Green Bay, which eliminated Youngstown in four games with a 4-1 win (2 ENGs), despite the efforts of 2012 recruit Matt O’Connor. The 6-5 netminder from Toronto stopped 40 of 42 shots by the Gamblers, who more than doubled the Phantoms’ number of shots on goal. ►A Phantoms source tells THFB that during the season, O’Connor and a teammate, BC recruit Austin Cangelosi, would conduct a shootout competition they called the “the Beanpot final” just before the team's weekend games. It involved four breakaway attempts--and a fifth if a tiebreaker was needed. According to the source, O’Connor came out on top a majority of the time. The rivalry resumes in 2013 when Congelosi arrives at the Heights. Three former Terriers are involved in the ECHL West Conference finals. Bryan Miller’s Alaska Aces have a 1-0 lead in the series with the Las Vegas Wranglers with Pete MacArthur and Ryan Weston. Weston was the only one to hit the scoresheet in Alaska’s 2-1 opening game win. Ask a BU fan to name his or her five most memorable Terrier wins that were not NCAA titles games and you’ll get a wide variety of responses . Younger fans are likely to call out the 2006 and 2009 Hockey East championship game victories over “the team from up the block,” two Red Hot Hockey victories over Cornell at Madison Square Garden or BU's the Frozen Fenway triumph over the Eagles. More “experienced” fans might choose BU’s first hockey East title in 1986 when Peter Marshall scored a hattrick, the 7-6 come-from-behind win against Clarkson in the 1977 ECAC semifinal when BU scored three times in the game’s final minutes, or reaching way back, the 13-6 blowout of Princeton at MSG’s Holiday Festival in 1966 when legendary sportswriter Red Smith dubbed the sophomore combination of Herb Wakabayashi, Mickey Gray and Serge Boily as “the pinball line,” after witnessing their 13-point effort. A few of our blog contributors like to recall the 1990 comeback win at Michigan State, overcoming a 3-1 deficit to win, 5-3 and move on to the Final Four. Personally, I’m partial to the 1970 Beanpot championship win against BC when BU’s top defensive forward, Wayne Gowing, scored a third-period hattrick for a 5-4 win. However, anyone who’s been a diehard Terrier fan for at least 15 years will certainly point to BU’s 3-2 upset of defending national champion Michigan in the 1997 NCAA semifinal. 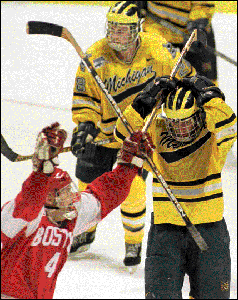 With seven 20-goal scorers and standouts in Brendan Morrison, John Madden and Marty Turco, the Wolverines were ranked #1 virtually all season. BU had earned its third Hockey East title in four years, but the lean Terrier roster had considerably less firepower. Yet a perfect game plan, well executed, produced a truly memorable victory. In his latest “Terrier Tales” feature article, blog contributor mh82 has chronicled the 1996-97 season, including the the Michigan game, when “a few good men” made Terrier history and nearly brought home another NCAA title. When the Boston University hockey team skated onto the ice at the Riverfront Coliseum in Cincinnati for a semifinal round matchup against the University of Michigan in the 1996 NCAA Tournament, the Terriers did so as defending national champions. Just 361 days earlier, BU had defeated Maine 6-2 in the 1995 title game at the Providence Civic Center, earning the school's fourth NCAA crown and its first since 1978. The Terriers had begun the 1995-96 season with a talent-laden roster that included a pair of returning All-American forwards in First Team selection Mike Grier and Second Team pick Chris O'Sullivan, with those two the top two scorers on the national championship squad. Joining Grier and O'Sullivan were 10 other veterans who had helped the Terriers capture two consecutive Hockey East championships and had competed in two straight NCAA championship games, losing to Lake Superior State in 1994 and downing the Black Bears in '95. Coach Jack Parker and his club had their sights set on becoming the first school to string together three straight Hockey East titles and the first to win back-to-back NCAA championships since the dominant BU teams of the early 1970s turned the trick in '71 and '72. "We have enough skill to have a successful season," Parker said of his team in the preseason. "Just how successful we are, though, depends on our mental approach. It will be interesting to see how the players come together as a team. That is going to be very important this year because everyone will be pointing to us [as defending NCAA champions]." Note: This video is now included in our page of "Milestone Goals and Games" in the Video Highlights section of our sidebar. Millan was a repeat winner of the Brown Award. In addition to receiving the Eilberg Scholarship, Ruikka will graduate with two bachelor's degrees in economics and math along with a master's degree in economics. He also received the College of Arts & Sciences Prize for Excellence in Economics. Team USA captured its fourth consecutive gold medal at the World U18 Tournament with a 7-0 thrashing of Sweden in the championship game. 2013 recruit Danny O’Regan scored a goal and assist and was +4 for the game. He skated on the squad’s top line, which accounted for five of the seven goals. 2012 recruit Matthew Lane was named one of the top three U.S. players in the tournament, along with Seth Jones and Collin Olson. 2012 recruit Matt Grzelcyk also was a member of the gold-medal winning team. 2012 recruit Robert Polesello and 2013 recruit Robbie Baillargeon each scored a goal in Indiana’s 5-2 win against Dubuque in the first game of the playoff series. Then next night, Baillarageon scored the Ice’s first goal in a 6-3 win. 2012 recruit Matt O’Connor stopped 40 shots in Youngstown’s 5-3 win against Green Bay, evening the USHL quarterfinal playoff series at one apiece. Former BU assistant captain Brian Strait played in Pittsburgh’s final three games of its first-round playoff series against Philadelphia, which the Flyers won, 4-2. Six years ago, Strait captained the gold-medal winning Team USA at the World U18s, which, like this year's U18s, also featured three future Terriers, the other two being Colin Wilson and Luke Popko. Joe Pereira’s fourth goal in seven playoff games was Idaho’s only score in the Steelhead’s 4-1 loss to Las Vegas in ECHL playoff action. Chris Higgins has 10 points (2g, 8a) in nine playoff games for South Carolina/ECHL. 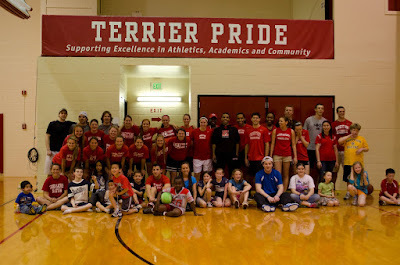 Watch for the next installment of Terrier Tales this week. Blog contributor mh82 looks back 15 years to 1996-97 Terriers "few good men" squad that won the Hockey East title, advanced to the Frozen Four and then upset defending champ Michigan in the NCAA semifinal. The Daily Free Press provides a final wrap-up to the 2011-12 season with four articles: a look back at players who stepped up, a look ahead to next season, an analysis of the team’s response to player departures and Coach Jack Parker’s own examination of player conduct. 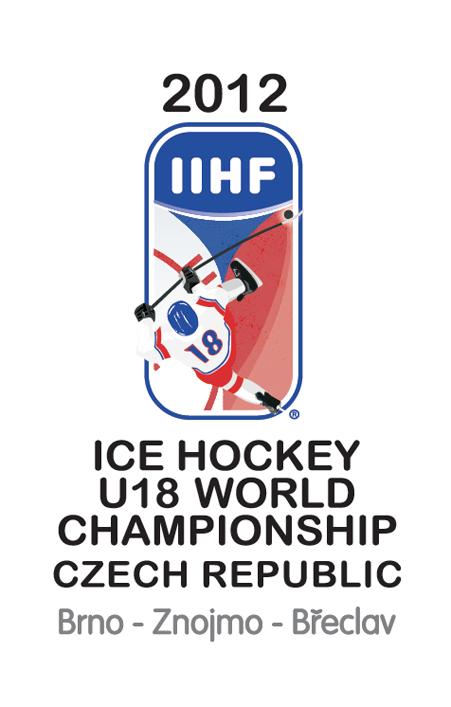 At the World U18 Championships, Team USA is rematched against Canada today at 1 p.m. ET in a semifinal game with the winner playing the victor of the Sweden-Finland game for the gold medal. United States of Hockey previewed the U.S.-Canada game. Two former Terriers will be with Team USA in the IIHF Men’s World Championships this May in Helsinki and Stockholm. John Curry, 2006-07 Hockey East Player of the Year and a two-time All-American, has been added to the team USA rosterCurry played for the Hamburg Freezers in the DEL this season, recording a 2.73 GAA and a .913 save percentage. .He previously played for Team USA in the 2007 and 2011 Deutschland Cup events. His performance in 2007 helped Curry vault from the ECHL to the Penguins AHL team where he became the team’s top goalie. David Quinn, former BU Associate Head Coach, and current head coach of the AHL Lake Erie Monsters, has been named an assistant to US Coach Scott Gordon. ESPN Dallas spoke with Alex Chiasson about his initial pro hockey experience with the Texas Stars. When 2012 recruit Marc Hetnik, Jr., arrives at BU next fall, Terriers will have four Vernon Vipers alums on the roster, the others being Sahir Gill, Ryan Santana and Garrett Noonan. Former Terrier Ken Magowan, who played for the Vipers a dozen years ago continued his pro career in Germany, with a strong 40-point season with Mannheim. ●● Please note a new addition to the sidebar list of links. It’s College Hockey Prospective, which provides news and profiles of hockey prospects who Division 1 recruits. Among the autographed prizes raffled were: three items from 1980 U.S. Olympic team captain (and BU standout) Mike Eruzione—a puck, Wheaties box and photograph of the game-winning goal in the “Miracle on Ice” win against the Soviet Union; a Matt Gilroy Ottawa Senators jersey, a baseball from Kevin Youkelis, and a Jacoby Ellsworth Red Sox Jersey. All proceeds raised during the event went to benefit the Autism Research Foundation. BU is the first University to support Athletes-4-Autism and the men's and women's hockey team are actively involved with Autism Speaks. The men's team has partnered with the national autism awareness organization for the past eight years. Earlier this year, Coach Jack Parker taped a public service announcement for Autism speaks. 2012 recruit Matt Lane continued to have a hot hand at the World U18 Championships in the Czech Republic, scoring his third goal of the tournament and adding an assist in Team USA’s 5-3 come-from-behind win against Canada. The speedster from Rochester, N.Y., set up the game-winner and then added an empty-netter to seal it. In the first period, he was pulled down on a breakaway, earning a penalty shot, which was turned aside. 2012 recruit Matt Grzelcyk had produced Team USA’s first goal with power play blast from the top of the circle. Lane is his team’s point leader with a 3-3-6 line and third overall in the tournament, as well as plus/minus leader with +6. With the win, USA gains a bye into the semifinals as it seeks to again repeat as gold medalist. United States of Hockey's Chris Peters, who is doing play-by-play of the Webcasts of Team USA games, listed Lane and 2013 recruit Danny O'Regan as two of the top performers for the defending champions. Matt Lane — Lane got another two points on the night, but was a factor in a variety of other ways. His speed is incredibly tough for most teams to deal with, and he rarely, if ever, loses a puck battle along the boards. He isn’t necessarily big, but he is incredibly strong and uses that strength well. He had a penalty shot in the first period, in which he got robbed, but his speed and strength is what helped draw that penalty-shot opportunity. Lane now leads the U.S. with six points (3g-3a). particularly in the faceoff circle. Canada’s centermen were very good on draws, but O’Regan won nine of his 12 faceoffs. He was the only U.S. center with more than three faceoffs that finished in the plus, winning 75 percent of his draws. He, along with Nic Kerdiles and Ryan Hartman also did a great job of creating offense, despite none of the three scoring goals of their own. 2014 recruit defenseman Jonathan MacLeod has accepted an invitation to join the NTDP U17s next season following a strong season at Kimball Union Academy with teammate and blueline partner 2013 recruit Doyle Sommerby. A third KUA standout, one with BU ties, is taking his college career further west on the Mass Pike. UMass 2014 recruit Casey Miller is the son of former Terrier and NHLer Paul Miller, who played on BU’s 1978 NCAA champions. Current Minuteman Coach Don Cahoon, also a KUA alum, was an assistant BU coach on the ’78 title team. 2012 recruit Matt O’Connor turned aside 30 of 32 shots as Youngstown thumped Cedar Rapids, 6-2, to sweep the Roughriders, 2-0, in the first round of the Clark Cup USHL playoffs. With the victory, O’Connor has 30 total victories this season. Next up for the Phantoms is Eastern Conference top seed Green Bay. Second seed Indiana (Robert Polesello, Robbie Baillargeon) had a first-round bye and now takes on Dubuque in the conference semis. ►USA Hockey has announced the first All-American Prospect Game, which will feature the top American prospects eligible for the 2013 NHL draft. The game will be held on September 29 in Buffalo. A pair of former BU captains figured in the Las Vegas Wranglers’ 3-2 OT win against the Idaho Steelheads, in ECHL playoff action. Pete MacArthur had given the Wranglers a 2-1 lead in the second period, but Joe Pereira sent the game to overtime with a goal coming with less than two minutes left in regulation. Former Lowell standout Scott Campbell netted the winner for Las Vegas. Team USA registered a pair of shutout wins at the World U18 Championships over the weekend, with future Terriers playing important roles. Despite being the only non-NTDP player on the team, he sure doesn’t look like it. As one of Team USA’s more creative players, offensively, O’Regan found space well and showed off some high-end puck skills. It was another great effort out of this forward. He’s shown good chemistry with linemates Kerdiles and Hartman as well. Lane had another big game for the U.S. with a goal and an assist. He also has four points in the tournament with two goals and two assists. Lane makes a lot of plays with his speed and gritty nature along the boards. His relentless forechecking has made it difficult on opposing defenseman and has helped lead to scoring chances. He’s having a very strong tournament. With a 2-2-4 line and a +4, Lane is co-leader of Team USA in scoring and tied for third overall. Team USA, which faces Canada tomorrow in the final preliminary round game, has already clinched the top seed in Group A and gets a bye into the tournament semifinals. In the first part of Team USA’s video postcard from the Czech Republic, Lane charges up his teammates as they head onto the ice. ► The University of New Hampshire named goalie Kieran Millan the winner of the Terry Morton Most Worthy Opponent Award. During the 2011-12 season, Millan recorded a 4-1-0 record with a 1.67 goals against average against the Wildcats. 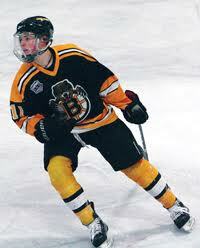 selected in the NHL draft and being reunited at BU with longtime friend and fellow Charlestown native Matt Grzelcyk. NEHJ ranked Collier, a Boston Globe Super Team All-Scholastic, as #5 and 2013 recruit Robbie Baillargeon #2 among New England-born prospects for the 2012 NHL draft. Former Terrier and NHLer Joe Sacco received a two-year extension on his contract as head coach of the Colorado Avalanche. John McCarthy assisted on the game-winning goal as Worcester concluded its season with a 3-2 win against Hershey. McCarthy was the Shark’s leading scorer with 47 (20-27) points in 65 games. Colby Cohen’s 4th goal of the season, assisted by David Warsofsky, pulled the Providence Bruins past Portland, 3-2, in the P-Bruins season finale. Cohen finished the season with 15 points in 58 games, while Warsofsky had a 5-24-29 line in 66 games. Terrier captain Jenn Wakefield, sophomore Marie-Philip Poulin and former BU blueliner Catherine Ward all skated for Canada's gold-medal winners in the 2012 Women's World Championships in Burlington, Vermont. 2013 recruit Robbie Baillargeon, who has 47 points in 53 games for Indiana and who was ranked #50 among North American skaters in the final NHL Central Scouting draft rankings, has been invited to the NHL Draft Combine in Toronto late next month. Alex Chiasson registered his first professional goal in Texas's 5-2 win against Chicago. Chiasson and former Terrier Dan Spang assisted on the Stars' final goal. Former BU blueliner Adrian Aucoin assisted on the game-winner in Phoenix's 3-2 win against Chicago. Kevin Shattenkirk scored one assist and logged 33 minutes of ice time in St. Louis 3-2 loss to San Jose. Former Terrier Bryan Miller, who put up career high stats for the Alaska Aces, was named a first-team ECHL All-Star. Team USA is in the Czech Republic for the IIHF World U18 Championships and will seek its fourth consecutive gold medal. Three BU 2012 recruits are on the U.S. squad, which is primarily members of the NTDP U18s. Defenseman Matt Grzecyk and forward Matt Lane have spent two years in the Ann Arbor-based USA Hockey progam. 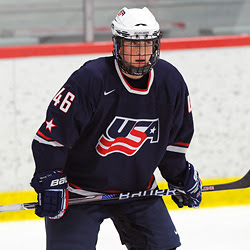 The third future Terrier is center Danny O’Regan, who was the only addition to Team USA from outside the NTDP program. O’Regan, whose father, Tom O’Regan, co-captained the 1982-83 BU squad, was a top scorer for St. Sebastian’s prep and for the Cape Cod Whalers. United States of Hockey has posted a pair of evaluations of the Team USA personnel . The first looks at the forwards and the second analyzes the defense and goalies. Team USA opens its title defense Thursday against Finland. In an exhibition game against Sweden on Monday, Team USA lost, 3-2. O’Regan assisted on the first U.S. goal. Team USA’s games will be Webcast by FastHockey.com with USof Hockey’s Chris Peters providing play-by-play. NHL Central Scouting has posted its final rankings for the 2012 draft. Of 24 ranked players with commitments to Hockey East schools, nine are BU recruits. Of the eleven Hockey East recruits ranked in Central Scouting's top 100, four are BU commits. #36-Sam Kurker, #50 Robbie Baillargeon, #76 O’Regan, #99 Doyle Somerby, #143 Brendan Collier, #145 Kevin Duane, #150 Lane, #177 Grzelcyk. Sean Maguire was #28 among goalies. Former Terrier Chris Bourque was the 2011-12 AHL scoring champion with 91 points for Hershey, 16 points more than his nearest competitor. John McCarthy, who spent part of the season in the NHL with San Jose, scored 42 points for Worcester. As the Stanley Cup playoffs begin, seven former Terriers will begin quests for the Cup: Adrian Aucoin (Phoenix), Matt Gilroy (Ottawa), Tom Poti (Washington), Kevin Shattenkirk (St. Louis), Brian Strait (Pittsburgh) and Colin Wilson and Brandon Yip, both with Nashville. Former Terrier defenseman and captain Kevin Shattenkirk finished his second NHL season with the same goal and assist totals as last season 9-34-43. He's the fourth leading scorer on the Blues and second in plus/minus with +20. Former Terrier captain Joe Pereira was trade by ECHL South Carolina to the Idaho Steelheads. 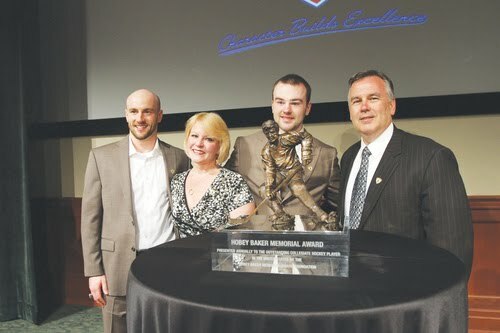 Jack Connolly, brother of Terrier captain Chris Connolly, (shown above with their parents) was named the 2012 Hobey Baker Award winner in Tampa at the Frozen Four yesterday. A three-year All-American, he led Minnesota-Duluth to its first ever NCAA title in 2011. (Larry Radloff photo). Both brothers attended the award ceremony wearing NCAA championship rings. Chris earned his in 2009 as a freshman. Another award announced in Tampa was the 2012 Hockey Humanitarian Award, which went to Yale’s Alecc Hughes, who was recognized for her extraordinary efforts to save the life of former teammate Mandi Schwartz, as well as the lives of others battling cancer. For the past two years, Hughes has organized a "White Out For Mandi" fundraiser at Yale's Ingalls Rink; the first raised over $20,000 to help the Schwartz family pay for medical expenses. Unfortunately, Mandi lost her fight and passed away in April 2011. Despite another strong game in goal by 2012 recruit Sean Maguire, who earned third-star honors. Powell River dropped the first game of the Fred Page Cup finals to Penticton, 3-1. Game twof the best-of-seven series will be played tonight. 2012 recruit Sean Maguire earned first-star honors for the second consecutive game, shutting out Surrey, 3-0, to give Powell River the BCHL Coastal Conference championship for the fourth straight season. Two days after stopping 49 of 50 Eagles’ shots in a 2-1 overtime Kings win, the 6-2 netminder turned aside all 27 Surrey shots in the conference title clincher. 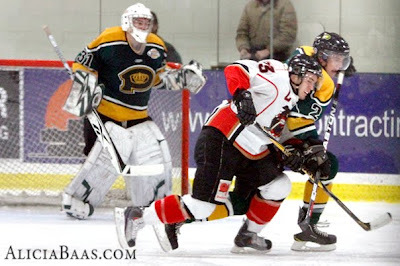 Powell River won the series, 4-1, and advances to the Fred Page Cup final against Penticton, beginning Friday. Maguire had enjoyed a strong regular season with a 2.33 GAA and .913 save percentage; for the second year in a row, he was co-winner of the BCHL award for best goaltending tandem (best combined goals-against average). He also was named 2nd Team All-Star for the Coast Conference. In the first two playoff rounds, Maguire has been even better, with a 1.82 GAA and .946 save percentage in 11 games. Against Surrey in five games, his numbers were 1.2 and .946. This past December, Maguire was the all-tournament goaltender at the World Jr. A Challenge, where he posted a 1.49 GAA and a .942 save percentage in four tournament games to help Canada West to the gold medal. Maguire outdueled highly regarded Swedish netminder Oscar Dansk in the semifinal game, won by Canada West, 2-1 in OT. He turned aside 28 shots. Then in the gold-medal game, he stopped 18 shots in a 4-2 win against Canada East. Former Terrier Travis Roy spoke today at BU’s Sargent College of Health & Rehabilitation Sciences about the mental challenges of his injury. He also was the guest on WBUR Radio’s All Things Considered. Paralyzed during the first shift of his first college hockey game in 1995, Roy has become a leading advocate for spinal cord research and founded The Travis Roy Foundation.